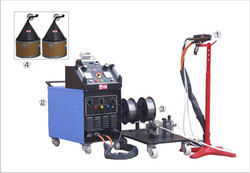 Leading Manufacturer of electric arc spray system from Jodhpur. Supported by the team of diligent professionals, we are providing Electric ARC Spray System to our clients. The offered system is extensively used for various spraying purposes. This spray system is acclaimed for its lightweight and easy operation. Our adroit professionals design these systems by using premium quality components and advanced technology which is in tune with the industry laid standards. Besides, we ensure to provide quality tested product to our valuable clients at affordable rates.